Our story today is called "The Last Leaf." 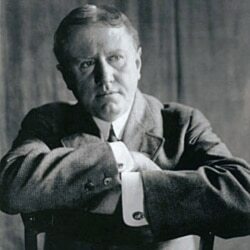 It was written by O. Henry. Here is Barbara Klein with the story. "She has one chance in -- let us say ten," he said. "And that chance is for her to want to live. Your friend has made up her mind that she is not going to get well. Has she anything on her mind?" "She -- she wanted to paint the Bay of Naples in Italy some day," said Sue. "Paint?" said the doctor. "Bosh! Has she anything on her mind worth thinking twice -- a man for example?" "A man?" said Sue. "Is a man worth -- but, no, doctor; there is nothing of the kind." Johnsy's eyes were open wide. She was looking out the window and counting -- counting backward. "Twelve," she said, and a little later "eleven"; and then "ten" and "nine;" and then "eight" and "seven," almost together. "Oh, I never heard of such a thing," said Sue. "What have old ivy leaves to do with your getting well? And you used to love that vine. Don't be silly. Why, the doctor told me this morning that your chances for getting well real soon were -- let's see exactly what he said – he said the chances were ten to one! Try to eat some soup now. And, let me go back to my drawing, so I can sell it to the magazine and buy food and wine for us." "Johnsy, dear," said Sue, "will you promise me to keep your eyes closed, and not look out the window until I am done working? I must hand those drawings in by tomorrow." "Tell me as soon as you have finished," said Johnsy, closing her eyes and lying white and still as a fallen statue. "I want to see the last one fall. I'm tired of waiting. I'm tired of thinking. I want to turn loose my hold on everything, and go sailing down, down, just like one of those poor, tired leaves." "Try to sleep," said Sue. "I must call Mister Behrman up to be my model for my drawing of an old miner. Don't try to move until I come back." Old Behrman was a painter who lived on the ground floor of the apartment building. Behrman was a failure in art. For years, he had always been planning to paint a work of art, but had never yet begun it. He earned a little money by serving as a model to artists who could not pay for a professional model. He was a fierce, little, old man who protected the two young women in the studio apartment above him. Sue found Behrman in his room. In one area was a blank canvas that had been waiting twenty-five years for the first line of paint. Sue told him about Johnsy and how she feared that her friend would float away like a leaf. Old Behrman was angered at such an idea. "Are there people in the world with the foolishness to die because leaves drop off a vine? Why do you let that silly business come in her brain?" "She is very sick and weak," said Sue, "and the disease has left her mind full of strange ideas." "This is not any place in which one so good as Miss Johnsy shall lie sick," yelled Behrman. "Some day I will paint a masterpiece, and we shall all go away." Johnsy was sleeping when they went upstairs. Sue pulled the shade down to cover the window. She and Behrman went into the other room. They looked out a window fearfully at the ivy vine. Then they looked at each other without speaking. A cold rain was falling, mixed with snow. Behrman sat and posed as the miner. The next morning, Sue awoke after an hour's sleep. She found Johnsy with wide-open eyes staring at the covered window. "Pull up the shade; I want to see," she ordered, quietly. After the beating rain and fierce wind that blew through the night, there yet stood against the wall one ivy leaf. It was the last one on the vine. It was still dark green at the center. But its edges were colored with the yellow. It hung bravely from the branch about seven meters above the ground. "It is the last one," said Johnsy. "I thought it would surely fall during the night. I heard the wind. It will fall today and I shall die at the same time." "Dear, dear!" said Sue, leaning her worn face down toward the bed. "Think of me, if you won't think of yourself. What would I do?" "I've been a bad girl," said Johnsy. "Something has made that last leaf stay there to show me how bad I was. It is wrong to want to die. You may bring me a little soup now." An hour later she said: "Someday I hope to paint the Bay of Naples." "Even chances," said the doctor. "With good care, you'll win. And now I must see another case I have in your building. Behrman, his name is -- some kind of an artist, I believe. Pneumonia, too. He is an old, weak man and his case is severe. There is no hope for him; but he goes to the hospital today to ease his pain." The next day, the doctor said to Sue: "She's out of danger. You won. Nutrition and care now -- that's all." "I have something to tell you, white mouse," she said. "Mister Behrman died of pneumonia today in the hospital. He was sick only two days. They found him the morning of the first day in his room downstairs helpless with pain. His shoes and clothing were completely wet and icy cold. They could not imagine where he had been on such a terrible night. And look out the window, dear, at the last ivy leaf on the wall. Didn't you wonder why it never moved when the wind blew? Ah, darling, it is Behrman's masterpiece – he painted it there the night that the last leaf fell."